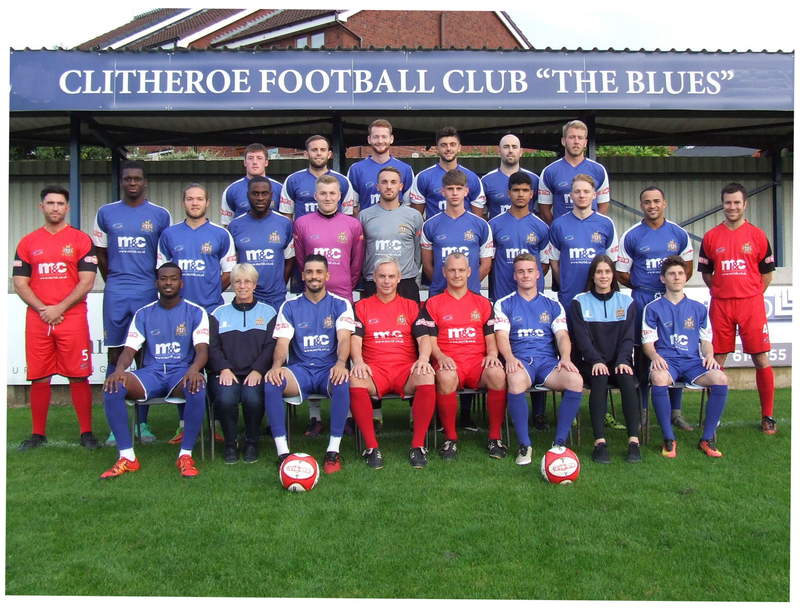 Clitheroe’s hopes of securing back-to-back victories for the first time under Stuart Mellish were dashed, as a valiant second-half display by Atherton Collieries, saw the Blues miss out on some vital points. The game was started by the visitors, who during the early stages, were struggling to cope with Clitheroe’s intense pressing. That pressing soon paid dividends in the 5th minute, as the Blues broke the deadlock after a corner was bundled home by Zehn Mohammed. Adam Morning’s corner, was only cleared as far as Max Hazeldine, who headered the ball back into the box, allowing the loose ball to fall to Mohammed, who side-footed the ball home to put the Blues 1-0 up. From the restart, the away side rallied, as on the 7th minute the scores were tied after Collieries’ Ben Conway used some skilful dribbling, to get past Ed Wilczynski and find Ben Hardcastle, who stroked the ball into the net. A mazy run by Connor Gaul led to a far-post cross which Conway met. The Collieries number 10, then picked up the ball and slalomed past the flailing Clitheroe backline and goalkeeper, before laying the ball off to Hardcastle, who put the ball into the empty goal to make it 1-1. The next quarter of an hour, saw Clitheroe step up a gear, as they controlled possession well and looked the more likely of the sides to next find the net. In addition to Clitheroe’s possession, Andreas Bianga received a yellow card on the 17th minute after he succeeded in breaking up a Collieries counter-attack. On the 21st minute, Clitheroe’s pressure, both in and out of possession, paid off as Obi Anoruo grabbed his second league goal of the season. Hazeldine’s impressive pressure on Collieries goalkeeper Morgan Bacon, saw the shot-stopper misplace a pass, straight to Anoruo’s feet. The pacey forward then drove towards goal, before calmly stroking the ball into the net, from just outside the area to put his side back ahead at 2-1. With 24 minutes gone on the clock, the away side nearly drew level again after Conway’s cross found Jordan Cover in the centre. Although the move was good, Wilczynski was equal to the header from point-blank range, as he kept hold of the ball. Half an hour into the game, Hazeldine nearly increased Clitheroe’s advantage to three, after turning his marker and firing at goal. Although the shot was powerful, Bacon was equal to it, as he denied Clitheroe a third. That shot by Hazeldine proved to be his last action of the game, as he was withdrawn minutes later due to injury and replaced by James Sloane. With half-time looming, Clitheroe earnt an attacking corner, as Anoruo’s cross was deflected behind. Morning’s floated corner, saw Jay Jeffries find the top corner, after some poor marking by the away side saw Clitheroe’s number 6 create the shooting opportunity to make it 3-1. After a couple of added minutes were played, referee Michael Crusham brought the very positive half – at least from a Clitheroe perspective - to a close. After the break, the Blues restarted the game, but their failure to retain possession saw the away side grab the half’s first goal, as they made it 3-2 on the 46th minute. Hardcastle slipped in Gaul, who rounded Wilczynski, before seeing his shot superbly cleared off the line by Mohammed. Gaul’s persistence soon paid off however, as his second bite of the cherry saw the ball bypass Wilczynski and nestle into the net. On the hour mark, Atherton made their first change of the evening, as David Sherlock was introduced in-place of Daniel Lambert. Minutes after the change, Atherton drew themselves level after some lovely play between Hardcastle and Conway saw the latter net the equaliser, to make it 3-3. Hardcastle played in Conway with a sublime scooped pass, which eliminated two Clitheroe defenders. Conway then wasted no time in stroking the ball past the onrushing Wilczynski to cancel out Clitheroe’s goals. Stuart Mellish immediately reacted to his side’s downfall with a double substitution, as Morning and Anoruo were replaced by Antoine Recizac and David Mannix, respectively. As the 83rd minute approached, there was no real suggestion that either side would end the game with the victory, until Atherton made their final changes. The two substitutions that entered the field were James Sigsworth and Luke Giverin, who replaced Jordan Cover and Connor Gaul, respectively. The introduction of James Sigsworth, proved to be a stroke of genius by Collieries manager, Michael Clegg, as the substitute scored with his first touch on the 84th minute, to give his side the lead their second-half performance arguably deserved. The counter-attack saw a low cross from the wing, roll into the box and land at the feet of Sigsworth, who had enough composure to immediately pull the trigger and put his side ahead for the first time, as the scoreline became 4-3. Despite grabbing what seemed to be the winner, Clegg’s side were not done there, as Ben Hardcastle made it 5-3, during the final minute of the 4 added on. Ben Conway returned the favour of an assist, by slipping his teammate through with only Wilczynski to beat. Hardcastle stormed towards goal and had the ability to finish the tie at 5-3, which capped off a fantastic night for Hardcastle and his side, but a disappointing evening for the Blues. With Stuart Mellish’s side still searching for their first home win of the season, their attentions now turn to 3pm on Saturday, 15th September, where they host Colwyn Bay, who are currently mid-table.